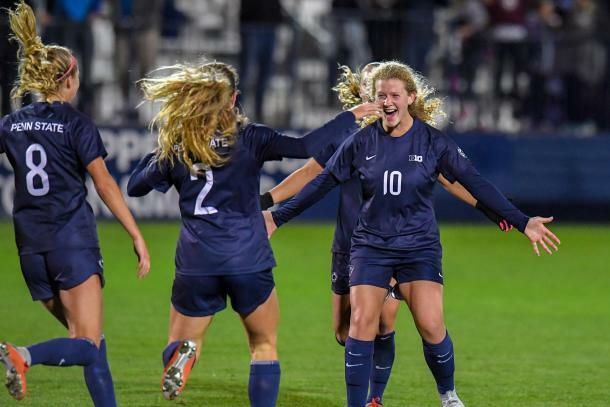 The Portland Thorns selected midfielder Emily Ogle out of Penn State in the 2019 NWSL College Draft. On January 10th, the 2019 NWSL College Draft took place in Chicago, Illinois. 36 players were drafted to play professionally in the NWSL and one of those names will continue her soccer career in Portland, Oregon. Portland Thorns FC selected midfielder Emily Ogle out of Penn State University with the 24th overall pick in the draft. Heading into the draft the Thorns were originally supposed to have two picks; one in the second round and one in the fourth. The Thorns took part in two trades which left them with only one pick in the third round. The first trade came from the Washington Spirit. The Spirit received the 17th overall pick from the Thorns in exchange for the 31st overall pick in the 2019 draft and Washington's natural second round pick in the 2020 NWSL College Draft. The Thorns then had the 31st and 35th overall picks in this years draft, until, the next trade came along. The second and final trade of the day for the Thorns was with the Chicago Red Stars. 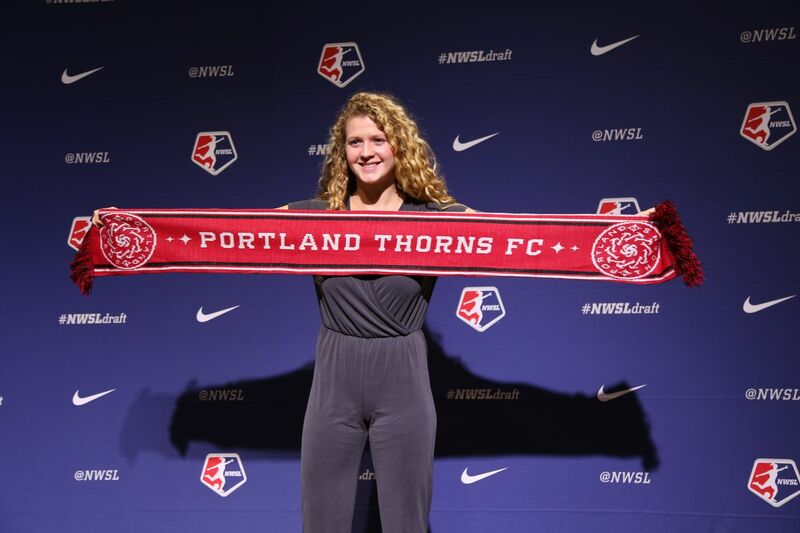 The Thorns acquired the 24th overall pick from the Red Stars in exchange for their 31st and 35th overall picks in the 2019 draft. Using this 24th pick from Chicago, the Thorns selected a new midfielder, Emily Ogle. Emily Ogle is a midfielder from Penn State University. Ogle is a redshirt senior after being sidelined with an injury in 2016. Coming into the draft, Ogle was a player to watch considering her impressive career at Penn State. Ogle played in 100 games (100 starts), scoring 20 goals and tallying 21 assists. In her four years, Ogle scored 5 game winning goals including two in her senior year. In both 2017 and 2018, Ogle was on the MAC Hermann Trophy Watch-list. In her senior season, Ogle was named All-BIG Ten First Team, BIG Ten Midfielder of the year, BIG Ten Preseason Honors list, United Soccer Coaches Second Team All-American, United Soccer Coaches All-North Region First Team and United Soccer Coaches All-Midwest Region First Team. While leading her team to an NCAA National Championship in 2015. Ogle has also had experience with multiple U.S. Youth National teams. Her most recent national team experience was in the 2017 U-23 La Manga tournament where she played in two of the three games. She was also apart of the 2016 U-20 FIFA Women's World Cup team, starting all six matches. In 2016, Ogle was nominated for the 2016 US Soccer Young Female Player of the Year. She has also played with the U-19's, U-18's and U-14's. How does Ogle fit in Portland? With new NWSL regulations, teams are allowed to have 22 players on their roster. A four player addition from previous seasons. Due to this fact, Ogle is more likely to be able to battle for a spot on the roster next to 2018 draftees Sandra Yu and Gabby Seiler who were injured last year. According to head coach Mark Parsons, Ogle is a versatile player that can play either a defensive midfielder or more of an attacking midfielder. She could be a very important piece for the Thorns when they face the absences of many key players during the 2019 FIFA Women's World Cup. Ogle was predicted to go much earlier in the draft so the fact that she was still around in the third round was a huge steal for Portland. Parsons said that her best qualities were her vision of the field and her ability to distribute the ball, both important qualities for midfielders. Emily Ogle will have her work cut out for her in order to make the Thorns 2019 season roster but her talent gives reason to believe she will be apart of it. Ogle still has the opportunity to turn down the Thorns offer and elect to play overseas just like all players who were drafted. Preseason for the Thorns will begin on March 4th with the 2019 NWSL season coming to a swing in April.